Manchester City have suffered a major injury blow ahead of the Liverpool game with midfielder Ilkay Gundogan likely to miss the Premier League clash. 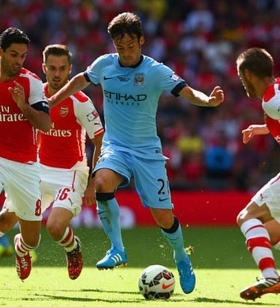 David Silva has indicated that he does not plan to see out his playing career with Manchester City. Manchester City coach Pep Guardiola has praised David Silva's performance against Huddersfield Town in the Premier League, describing it as outstanding. Premier League trio Marcos Alonso, Alvaro Morata and Cesc Fabregas have been omitted from Spain's World Cup for the tournament this summer in Russia. It comes as a major surprise for the duo, who play for Chelsea together. It has not been a season to remember in La Liga for reigning champions Real Madrid and they are already monitoring potential targets to assure that they mount a serious challenge next season to regain their title. One player in particular that Los Blancos are reported to be interested in is a Manchester City star who has been in the form of his life this season. Are Man City better than Arsenal's Invincibles? Over the years, the Premier League has thrown up some tantalising teams and many pundits will argue that Pep Guardiola’s Man City are emerging as the next team to fit the bill. Currently unbeaten in the league this season, the Citizens are playing some of the best football we’ve witnessed in England, and many are understandably starting to question whether they can emulate Arsenal’s historic Invincibles season. Manchester United manager Jose Mourinho has updated on the fitness of Marcos Rojo and Phil Jones prior to Wednesday night's Premier League clash versus Bournemouth. Manchester City manager Pep Guardiola has confirmed that David Silva has recovered from a minor injury scare which kept him out of the midweek Champions League defeat at Shakhtar Donetsk. Perhaps the highest accolade of all in football is being labeled the ‘best coach in the world’ by Pep Guardiola and Mauricio Pochettino. Marcelo Bielsa is widely considered amongst the best. England international Raheem Sterling will reportedly be rewarded with a fresh contract at Manchester City following his excellent form during the ongoing campaign.